The Toffees were without four nailed on starters with Mirallas, Neville, Fellaini and Gibson all out due to injury and suspension. 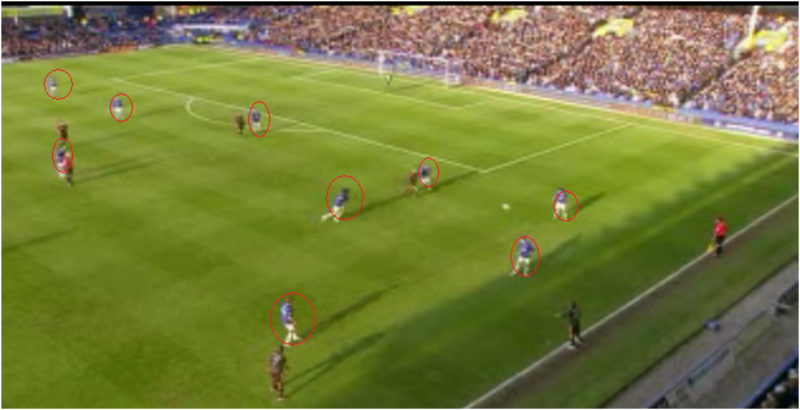 Moyes sprung a surprise in terms of shape by playing Pienaar central behind Jelavic and Anichebe on the left. Naismith came in on the right side of midfield with Heitinga coming in at centre back and Jagielka switching to right back. Chelsea started out in what looked like a 4-3-3 with Mata right and Ramires through the middle which was scrapped fairly early on moving to a 4-2-3-1 with Mata central behind Torres and Ramires as expected on the right to reign in Baines lateral marauding. Chelsea had more possession overall (54%) and more final third possession (53.5%) although we had more touches of the ball (226 v 204) in Chelsea’s defensive third than they did in ours. The game’s attacking moves were almost all exclusively down the Baines / Ramires flank with 10 of the 19 chances created by both sides coming from down this flank. Mata, Baines and Osman were all central to this and the trio had the joint most final third touches (40). The Blues were dominant in the first half with midfield schemers Leon Osman and Steven Pienaar almost exclusively running our offensive game as has been the case since Fellaini’s suspension. The half was characterised by enterprising play from us down the left when on the ball and high octane pressure when the ball was lost. Pienaar and Anichebe were interchanging well in the role of wide left and attacking central midfield, a tactic used rather disastrously in last season’s 0-3 reverse at Anfield. In the first half in particular, Heitinga would get the ball on the right of central defence and hit diagonals for Anichebe to attack in a physical miss-match against Azpilicueta. The Dutchman’s long ball accuracy was the best on the pitch and Anichebe won more aerials (6) than anyone from either side. Pienaar’s role centrally was twofold; firstly he would look to link midfield and attack and secondly when not on the ball he would press Chelsea’ defence >attack linkman Luiz in central midfield. The results were impressive. Firstly, the South African opened the scoring from a central position, registering the quickest toffee goal in the Premier League since Yakubu struck after 47 seconds against Portsmouth four years ago. The move owed much to Pienaar in its inception, getting the ball centrally and playing Jagielka in behind a day dreaming Ashley Cole. Jags is a good crosser for a defender and when his centre was headed onto the post by Anichebe it fell nicely for Pienaar to slot home for the second season running in this fixture. We have now scored in the last 17 league games which is our best since 24 in a row in the 85-86 season. In terms of his off the ball duties, Pienaar was equally industrious in the defensive zone and attempted more tackles (6) than any player on the pitch. As has been the case all season, our defence was unable to withstand any form of pressure as Chelsea came back on us in the second period as our all action high pressure game began to dwindle with fatigue becoming a factor. Ramires is a renowned flank shuttler with a great ‘engine’ and the fact he hadn’t started any of Chelsea’s Christmas programme with Lampard also having a week off was evident in their energy levels as the game developed. In comparison our key attacking triumvirate of Pienaar, Osman and Baines had played pretty much every minute in all 3 of our games in the last 8 days. Chelsea crept back into the contest just before half time with Ramires the key man in the visitor’s comeback. Firstly, he was given the time to take a touch, control and pick out Lampard who ghosted into the box unmarked to head Chelsea level. 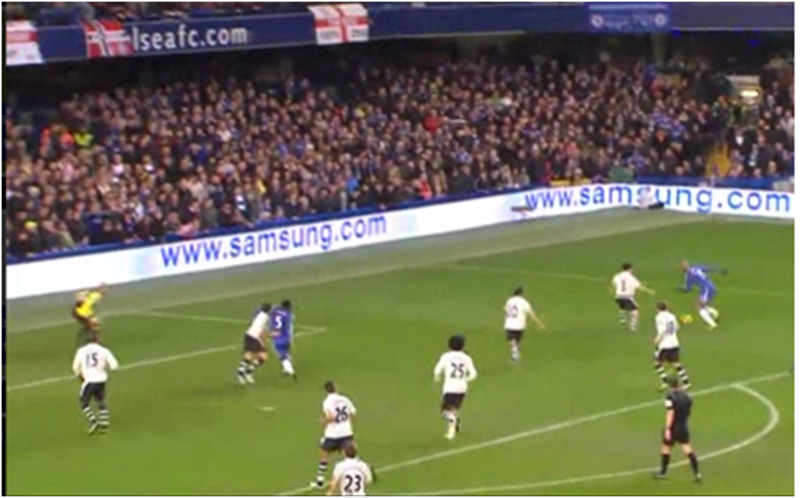 Ramires was again involved in the second goal as slack marking again enabled Lampard to prod home from close range after a Mata delivery. Moyes switched to 4-3-3 with Velios joining Jelavic and Anichebe in a physical forward trio but in truth we had minimal options from the bench which could give Chelsea anything new to think about. Barkley’s cameo was also an example of why Moyes has been loathe to give him more game time since his return from Sheff Wed. If we can get Gibson back and perhaps bring in Vadis Odjidja from Brugge it would probably be worth Barkley heading back to Hillsborough where he can continue to develop his game which is still a bit short for this level. This was a game the Blues deserved more from and will rightfully feel disappointed not to have taken at least a point. In the first half in particular we dominated proceedings and overall had more shots and struck the woodwork 3 times to Chelsea’s 0. There was always the worry that the pressure play would be hard to maintain for 90 minutes given how thin our squad is and so it proved as Chelsea were more involved in the second period with Mata and Ramires key to their more enterprising work on the break. There is little to be ashamed of in losing to the expensively assembled European Champions with fine margins and bad luck to blame for this narrow loss. With Fellaini back and a run of fixtures against some decidedly gash looking sides there is plenty to be optimistic for as we head into 2013. After the gritty wins against West Ham and Wigan comes the festive period’s stand-out toffees fixture as Chelsea and their portly new boss Rafael Benitez waddle down to L4. The Spaniard is a known tactical schemer and will have had our strategy studiously examined for potential gains with the same meticulous detail he would regularly scrutinise the All you can eat buffet menu in Tsos during his time on Merseyside. Chelsea’s side will be something like a 4-2-3-1 with Cech in goal and a defence consisting of Azpilicueta, Cole, Ivanovic and Cahill. As with any Benitez side they have shipped few goals with 4 clean sheets in 6 in the league since his arrival. An example of the portly Spaniard’s attention to detail in tracking runs and at set plays is below…. Predicting their midfield setup will be much trickier. David Luiz has started there lately and although Mikel partnered him against Norwich on Boxing Day I fancy Lampard’s experience will see him preferred for this one. 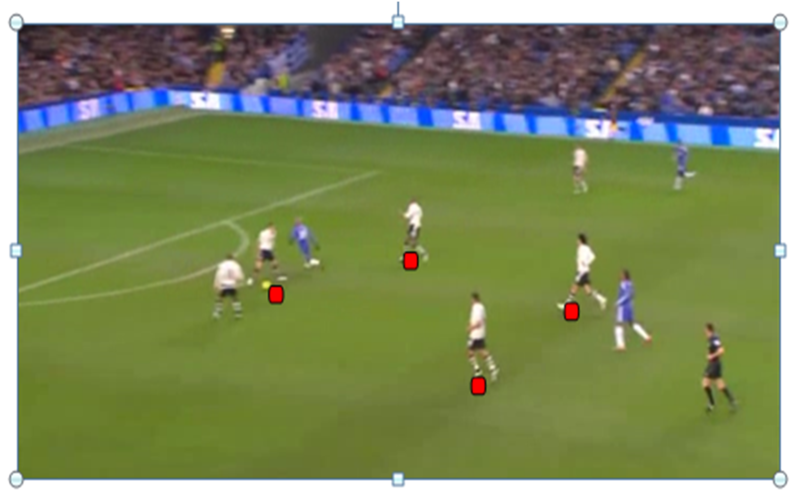 Both Lampard and Luiz prefer to push forward which could give us an area to exploit. In the advanced midfielder slots its anyone’s guess but I’d go for Mata central, Hazard left and Moses right although the trio can all interchange so don’t be surprised to see them popping up here, there and everywhere. The trio all bring something to the table offensively. Mata is the league’s chief creator with 7 assists whilst Hazard has won 45 fouls, second only to Pienaar in the ‘most fouled’ stakes. Moses is impish and direct, will look to dribble and basically be a pain in the arse to defend against. Up front, ‘Nando’ Torres hit 17 shots on target in 17 games under previous boss Roberto Di Matteo this season, compared to 16 in the first 5 games under Benitez. Clearly they are getting the ball forward quicker and more regularly to the striker who is thriving off the service with his excellent goal against Villa last week a decent example. This should all be countered by the fact that Jagielka usually does very well against the forward. If the Wigan game showed us anything it was that placing Osman as close to the Baines/Pienaar axis is crucial to instigate pint sized mayhem. In the first half, stranded on the right flank, Osman was peripheral whilst in the second period when he switched to the centre he was afforded more space to instigate his trademark shimmies on the edge of the box and was positioned closer to link up with Baines and Pienaar. It was no coincidence that this resulted in our most fluid period of the game after the interval. For this reason I’d start him centrally alongside Gibson if the Irishman is fit to start after his red card was rescinded earlier today. Naismith will most probably come in on the right flank with Coleman still sidelined due to injury. Otherwise it’s probably going to be a similar 4-4-2 with Jelavic and Anichebe up front. Moyes record against Benitez at Goodison isn’t as bad as you’d think, winning 3 and losing 4 of the seven games at L4. All 3 wins were secured with clean sheets, something we are incapable of doing this season. Most of the matches between the duo have been cagey affairs with both bosses liking to tweak to negate the threat of the other and the game promises to be a tight, tactical joust. Betting wise, we’ve won our last three at home in the league against Chelsea and have only lost at home twice in 2012. Given their resurgence and the attacking personnel we have missing I’m going for a 1-1 draw, best offered at 6/1 by Ladbrokes. I’d stretch this a bit by looking at Chelsea to score first (probably Mata) and for us to come from behind, after all we’ve recouped 17 points from losing situations this season, only bettered by Taggart’s mob (24). You can get 9/2 on Everton to come from behind to either draw or win with Ladbrokes. The both teams to score option is as usual the ‘dead cert’ choice for our games; Chelsea have scored at least one goal in 89% of their away matches and we have scored in every home game and not kept a clean sheet at Goodison since the first day of the season. Everton unexpectedly made 5 changes from last weeks inept surrender to West Brom, with Rodwell and Fellaini coming into midfield, Saha replacing Yakubu and Coleman coming in on the right in a man marking brief to eliminate Ashley Cole down Chelsea’s left. Chelsea retained their 4-3-3 system with a rigid back four playing deep to accommodate the returning Terry . Everton lined up with a flexible 4-5-1, more 4-2-3-1 without the ball with Fellaini and Rodwell protecting the defence. Fellaini played on the left side of the centre, the spot recently occupied by Arteta, and his defensive solidity gave Everton a much better balance in midfield. 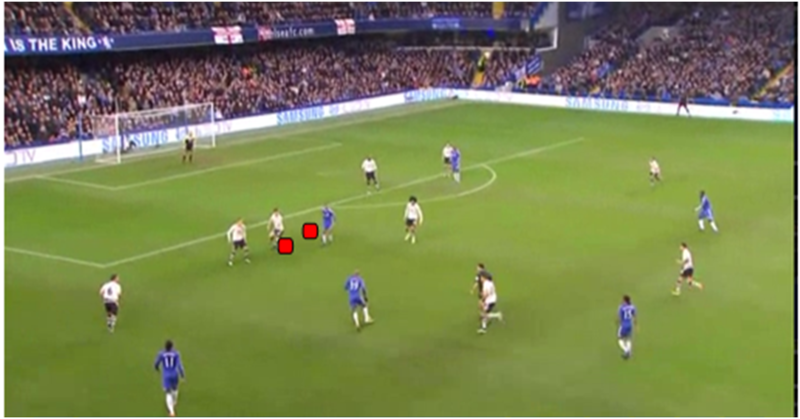 Pienaar, Cahill and Coleman occupied the more advanced positions. 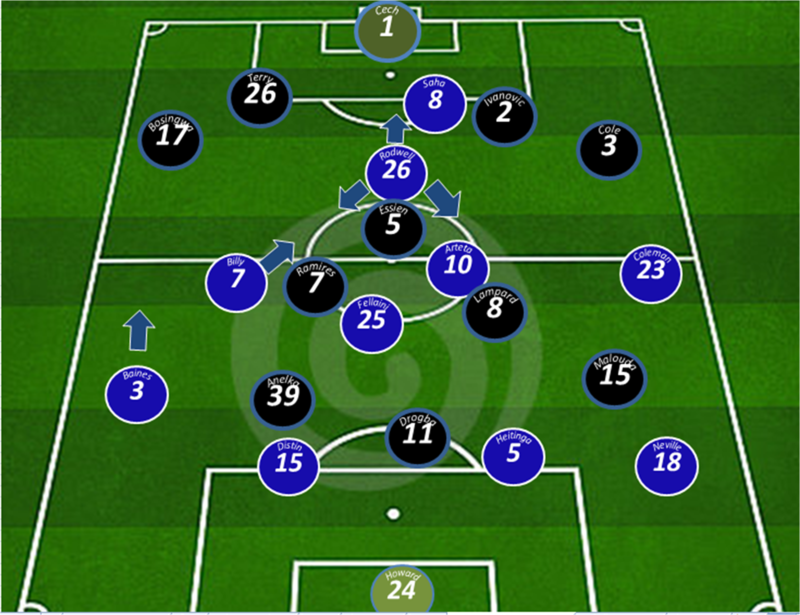 Diagram A below shows the average positions both teams occupied with Everton in blue and Chelsea in red. The first 30 minutes of the game was complete deadlock. 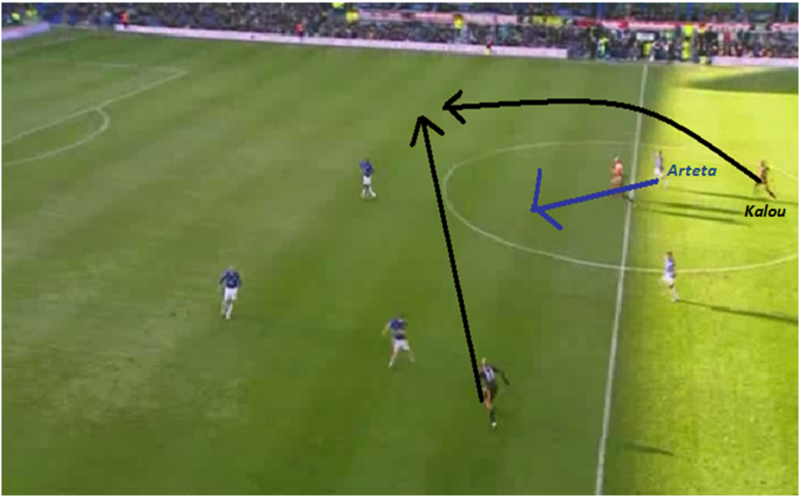 Moyes deployment of Coleman as a man marker for Cole shutdown the Chelsea left (diagram 2). 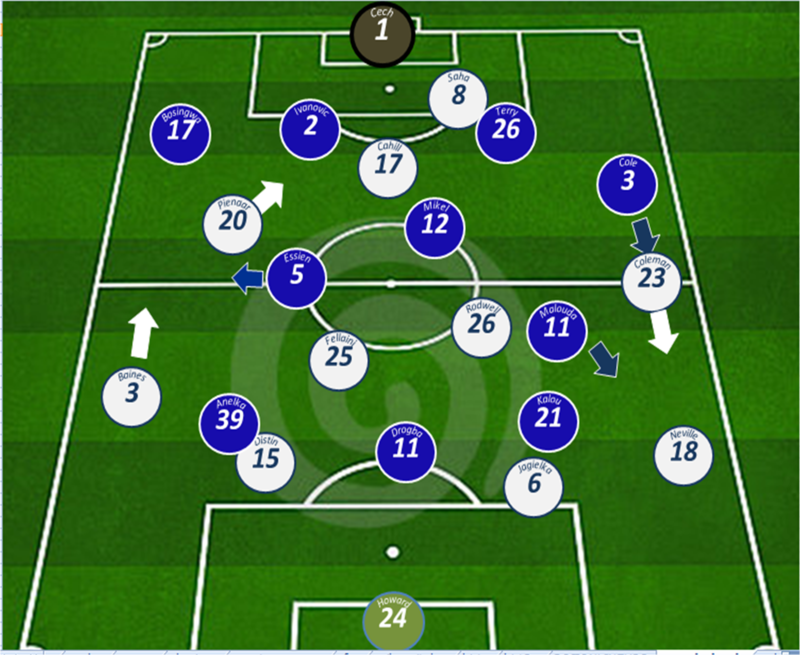 Chelsea where showing more going forward but Everton where pressing well and squeezing the space centrally. Indeed, a focus of the game would be on two English left backs with Ashley Cole and Leighton Baines pivotal to proceedings. Chelsea’s lack of width in midfield gave Baines the freedom of the left flank to smash 5 potent crosses from dangerous areas. In contrast, Cole was extremely well marshalled by Coleman, who forced him into making zero successful crosses (Chalkboard A). Stephen Warnock is of course somehow ahead of Baines in the England pecking order, but if anyone can give a plausible reason as to why this is the case I would be interested to know. Everton’s robust showing was undermined on the 42nd minute when Neville inexplicably passed back to Howard when potential offensive passes where on, gifting Anelka the opportunity to steam into Howard and win Chelsea a penalty. Probert’s decision to give Howard a yellow was the correct decision but to be fair it wouldn’t have been surprising if the knee jerk ref had dismissed Howard. The out of form Drogba duly lashed home from the penalty spot. The second half began with the Blues in determined mood. Clearly motoring, the Blues where sharper to every ball and pressing high up the pitch in contrast to the first 45 minutes. Pienaar was taking up a more central role with Baines almost playing as a left winger with Rodwell and Fellaini covering behind. 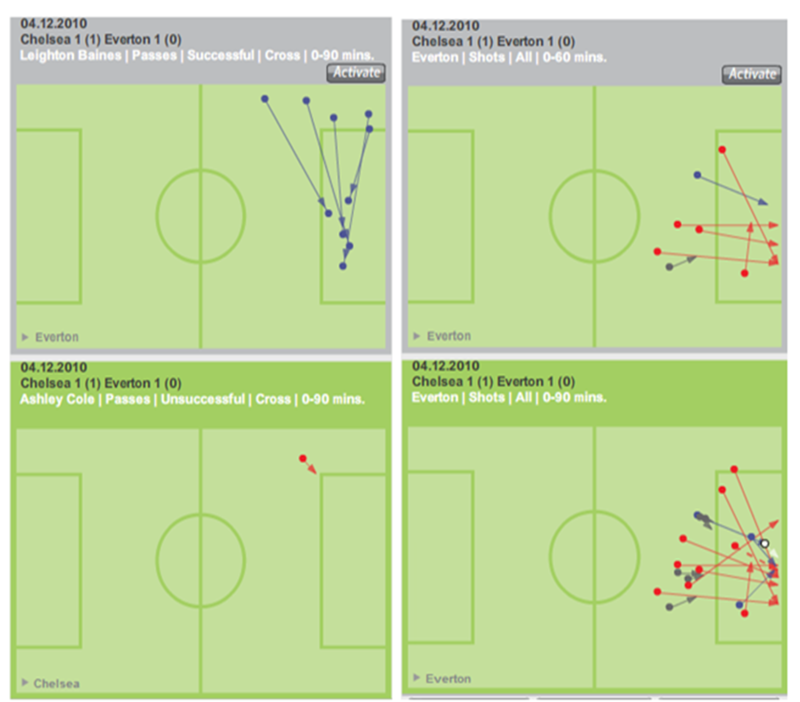 Despite this sharper bite, Everton were still struggling to provide traction to their attacking play, but this was to change on the hour mark with Beckford’s introduction . The change was to prove decisive, with the former Leeds man proving a thorn in ‘JT’s’ side, moving between his markers with greater regularity and getting in behind the Chelsea defence in a manner Saha failed to do. Chalkboard B shows this shift in play, with Everton forcing 7 shots in the first hour and then 11 in the last 30 minutes following Beckford’s introduction. Beckford ‘s misses made headlines last week but you can’t doubt the strikers eagerness and ability to get into goal scoring chances. Indeed, in the last 3 outings the striker has carved out 9 goal scoring chances in 72 minutes, compared with Saha’s 2 in 150 minutes. Beckford is still an unknown quantity at this level, but his potential and recent form mean that he must start the next game against Wigan. Everton had already hit the post when Baines got free and whipped in a delicious cross that the impressive Rodwell unluckily flicked onto Cech’s post after great work from the dominant Fellaini. Cahill as ever was Everton’s leader today, at the fulcrum of all that was good for the Blues and he angered Chelsea’s gross skipper Terry when going in for a 50-50 with Cech. The Aussie connected with Cech but was well within his rights to go for the ball. The former England skipper and part time love rat had been throwing his weight around all afternoon, notably saving Malouda and Ivanovic from cards. His pressure to get Cahill into trouble with the referee summed up the double standards with English players when it comes to influencing referees. Baines dominance down the left was so immense that Chelsea withdrew Bosingwa, clearly not as good defending as he is going forward, with the more defence minded Ferreira. The only disappointing factor was that Everton didn’t go on to take the 3 points as Chelsea where there for the taking with 7 minutes added on for stoppages. But in truth this was much improved display from the Blues. A great response by Everton following last week’s embarrassment to West Brom. Defensively Everton were water tight, restricting their opponents to few goal scoring chances until Neville’s moment of madness. Everton’s drive going forward, led by the determination of the midfield axis of Rodwell and Fellaini ( a refreshing change from the pedestrian offering served up lately by Arteta and Heitinga) enabled the Blues to press high in Chelsea’s half. 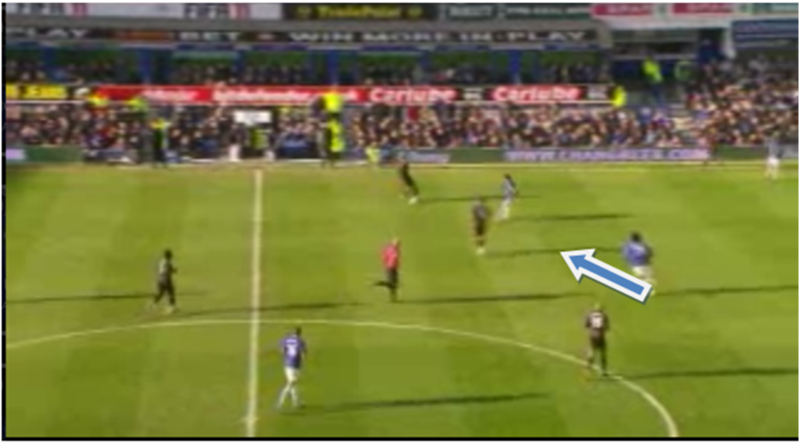 This enabled Baines to get on the ball in dangerous area and this was where The Blues made their point. A great showing.